Yes, I know it’s not quite ‘soup time’ yet! I’m working on a soup promotion with one of my favorite health/recipe organizations online, for their upcoming fall features (will keep you posted!). At the same time, I’ve been creating and ‘tweaking’ some new recipes and this soup was one I put together last week. The results were: hearty, satisfying, very colorful and delicious. Summertime truly is a great time for making veggie soups and I took full advantage of as many fresh garden (wish it was ours!) vegetables and herbs as I could, to add to the pot. Hope you will try and enjoy this recipe soon. In a large soup pot, heat olive oil over med-high heat. Add onions, carrots, zucchini and green pepper and sauté for 3 minutes. Cover, reduce heat to low and steam for 3 additional minutes to release flavors. Add all remaining ingredients (except peas, zucchini, green pepper and parsley) and bring to a boil. Cover, reduce heat to low and simmer for 35-40 minutes, until barley and rice are cooked. Add peas, zucchini and green pepper, parsley for last 10 minutes of cooking time. Adjust seasonings if required. Add a bit more stock or water if necessary, if soup is thicker than you desire. Sprinkle each serving with grated parmesan cheese if desired, just before serving. Recipe and photo by: Geraldine Hartman. Revised August 2013. All rights reserved. That looks so tasty! I wish I had some here right now. It’s still hot here, but I love soup, too! That looks divine! It’s soup time anytime (for me anyway.) I thin I’ll make a raw soup tomorrow. It’s a shame I don’t have my digital camera. I definitely would take a picture. Ahh soup for me it’s the ultimate comfort food! I can almost taste that bowl of soup from here. It looks so delicious! Thank you, thank you for sharing the recipe. I’ve never made soup but this autumn I want to try. That’s what I love about your blog – the pictures and recipes encourage me to attempt something new and healthy. well, we are in the throw’s of soup season around here.. chilly and damp.. fall has hit and this soup looks like just the ticket! thanks for sharing the recipe.. When I got up this morning it was 55 degrees! I’d say that it is closing in on soup weather fast here in the northeast US!!! I LOVE soup… any time of year. This looks delicious!! I’ve tagged the Mitz for a kitty meme…visit Mommie’s blog for details! I’m a “souper” soup fan as well. That brings back memories of my childhood when my grandmother would make me veg soup… yummers. Thanks for a great photo and for sharing the recipe of such a warming, healthy soup, G.
The soup looks delicious, and I think soup weather is just around the corner! you have a happy cooking weekend too! Yummmmmmmm is right! I love soup, too, and this looks delish. A word about colors…my sister-in-law’s grandmother used to say that the more color a meal had, the better it was. It’s true…the variety in colors of veggies also means a more balanced variety of vitamins and minerals! Hi Beth, Hope you give this recipe a try soon. Hi Melody, It was wonderful, thanks! Hi Opal, Yes, me too, I LOOOOOOVE soup, all year round. Hi Mary Anne, You are so kind, thanks for your kind words. And I hope you try this soup soon…. Hi Maid…., Great that you stopped by, I look forward to checking out your blog soon. Hi Sheep, Wow, talk about quick change in weather! It wasnt too long ago that you were talking about sweltering down there. Definitely soup time. Hi Tasha, Thanks, nice to see you back! Hi K, Thanks so much, I also really liked this photo. Hi Diana, It certainly is, cooler every day, I don’t mind though, hot weather drains me!!! Hi Teddy, And you too dear! Hi Michelle, Interesting re: the colors. Ive been reading a lot about that lately and isn’t that a nice plus, colorful food looks great and is better for us! Sorry about the problems with commenting. Anyone else having troubles? I couldn’t comment on quite a few Blogger blogs yesterday either…something in the air perhaps LOL…I did visit a lot of blogs though!!! That bowl of soup looks like you could just dive in. The trees are turning and so it is close to soup time. My husband and I love soup as a meal. Thanks! Definately will try it. For me, it’s soup time anytime! This looks So Good and healthy. Au contraire, here in RI, it’s been raining for 3 days and highs only in the 50s. This looks perfect for a day like today. Hi Elaine, As long as you are diving with a spoon LOL!!! Hi Caroline, Big weather fluctuations and fast, this time of year eh? I finished the rest of this soup for lunch today, it was still very yummy. 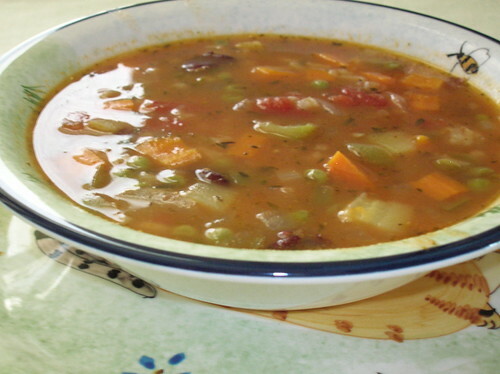 If your garden is overflowing with fresh herbs and veggies right now, give this soup a try. Geraldine, so am I…I LOVE soup! But it’s funny because I will even crave it during the summer months. However, fall and winter are my favorite times to eat a nice, hot bowl of soup. And this looks BEYOND delicious! I can smell and taste it from here! i love soup!!! it is the perfect winter meal!! !